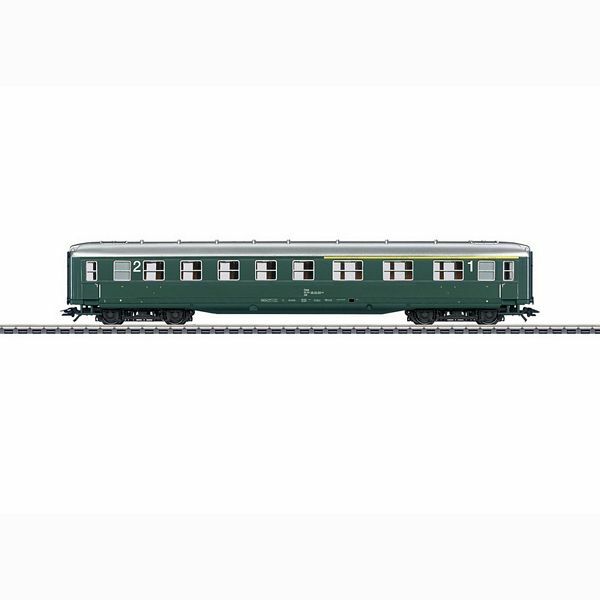 Prototype: Austrian Federal Railways (OBB) type C4u-38 "Schurzenwagen" / "Skirted Passenger Car", 1st/2nd class, in fir green. Model: The car is full-scale length, has an underbody specific to the car type, has rubber diaphragm connections, and center bars on the side windows. The 7319 current-conducting couplings or the 72020/72021 current-conducting close couplers can be installed on this car. The 73150 lighting kit or alternatively the 73400/73401 lighting kits (2 per car) with the 73405 pickup shoe can be installed on this car. Length over the buffers 24.4 cm / 9-5/8". DC wheel set E700580.